Today, our 5th graders went to camp as an end of year celebration. The forecast hadn't looked promising for a day planned entirely with outdoor activities, but Mother Nature was kind. We had amazing weather - sunny skies, a nice breeze, and warm temperatures. The kids had a wonderful day. They had their choice of many games, canoeing, rock wall climbing, s'more making, horse grooming, and much, much more. I had originally planned to go from spot to spot, checking in on students and chaperones, but after my first station, I stayed right where I was. See, I had started at the canoeing station, and it was a hoot and a half. That breeze I mentioned earlier really picked up in intensity at the lake, and watching students try to battle that breeze became quite comical at times. My teaching partner and I stood on the dock that they circled, and would shout encouraging words to them to help them navigate: "Pull on the left. No on the left. No, on your other left!" After these directions and still many canoes running into the dock or getting pushed the wrong direction by the breeze, I would get the giggles. You just can't buy entertainment like that. After all 6 of our groups rotated through the canoes, it was impressive that not one boat tipped over. However, at least 4 boats had to be rescued by the camp counselor because they lost control of their boat and got so far away from the dock, he had to tie his boat to theirs, and help row them back. I'm pretty sure they don't pay him enough, but he was a truly good sport about it. I'm guessing these weren't the first kids that had trouble with canoe navigation. But through the hilarity and fun, today was bittersweet for me. I mentioned a while ago that I have taken a literacy coach position, and I am quite excited by all that entails. However, moments with a community of children like camp today will not be part of my new job. I will miss that dearly. So as this school year winds down, I plan to hold on to every classroom and community moment I can. For more slices, head over to Two Writing Teachers blog. Thanks to the crew over there for hosting us each week! 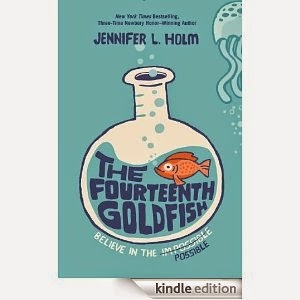 At the end of last week, I got to read Jennifer Holm's latest, The Fourteenth Goldfish, and loved it! I love the message of "believe in the possible" that occurs frequently throughout the story. Somehow Holm manages to mesh the realistic fiction genre with the science fiction genre in a very believable way. It was done so well, I never found myself questioning the unrealistic elements. I had to believe in the possible as well. This is a must have book!! 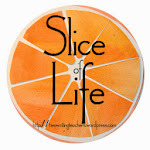 The other part of this post is what I will be reading -- the blogs Great Kid Books, The Show Me Librarian, Kid Lit Frenzy, and The Nonfiction Detectives. I recently saw on Google+ where MaryAnn Scheuer and her librarian colleagues have begun to help gather nonfiction titles around a high-interest topic, and then find books that gradually increase in text complexity. This process has produced book lists that will be wonderful resources for teachers, librarians, and parents as they help connect students with texts on a favorite topic, let them build some background knowledge, and then possibly move up in text complexity over time. I am so excited about this resource and can't wait to check out more of their collections! This is something teachers do on their own all the time, but what a wonderful starting point for all of us. 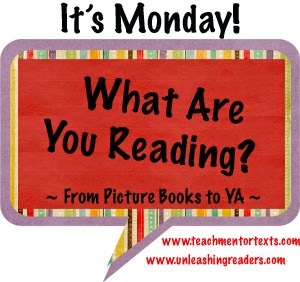 Check out what everyone else is reading at Teach Mentor Texts. Thanks to Jen and Kellee for hosting the kidlit version of this meme. One of the things I had hoped to post today was a picture of my feet in the beautiful waters of Longboat Key, Florida. Alas, a storm cloud full of much rain, thunder, and lightning has followed us to the south. However, the group of people we are with have been having a lot of fun; much laughter and hilarity has taken the place of the sunshine. Though I will be so glad to see the sun tomorrow and Monday, for now I am celebrating the fun and joy friends can bring. I am also celebrating the next phase of my professional life. I just received the news this week that I will be one of 6 literacy coaches in my district. Though the thought of leaving the classroom makes me a bit teary, the chance for professional growth in a new direction is quite exciting! Hope everyone has a wonderful week, and be sure to check out Ruth's blog for more celebrations.